Hawaii's Iwona Zagrobelna and NMSU's Niki Holt and Sherell Neal watched an errant pass sail out of bounds during last night's game, the WAC opener for both teams. The Hawaii women's basketball team battled to come back from a turnover-plagued first half, took a lead late in the game, but could not hold on. New Mexico State outscored the Rainbow Wahine 11-2 in the final 6 minutes to win the Western Athletic Conference opener for both teams 58-51 last night at the Stan Sheriff Center before a gathering of 304. Hawaii (6-7, 0-1) edged ahead 49-45 with 6:35 left on a pair of free throws by Brittany Grice. For the remainder of the game, the Wahine were 1-for-9 from the field and committed three of their 19 turnovers. Sherell Neal's jumper in the paint tied the score at 49 with 3:05 to go and Cecilia Russell-Nava's 3-pointer at 2:19 returned the lead to New Mexico State (6-7, 1-0) for good. "We did a great job on their leading player (Russell-Nava), but they had other people step up," UH coach Jim Bolla said. "Her 3-pointer was a big momentum swing. "We could never get a stop after that when we needed a stop and our execution was terrible at the end. We had plenty of time, but rushed the offense, and the turnover (a traveling call on Grice) with a minute left was big." The Aggies had success going inside to 6-foot-1 junior forward Anikia Jawara early. She scored six quick points as the visitors took a 8-4 lead in the first 4 minutes. Dalia Solia's 3-pointer at the 14:46 mark pulled UH to within a point. After Jawara went to the bench with her second foul, the Aggies responded by scoring the next nine points for a 17-7 lead. A 3-point play by Neal was sandwiched between Monique Bribiescas' two 3-pointers for the 9-0 run. Meanwhile, the Wahine were having a terrible time with their high-low game, committing five turnovers in the first 7 minutes. "We weren't throwing the pass accurately," Grice said. "We should have run the offense all the way through. I can't speak for the other post players, but I made the wrong read at times trying to force it." After Solia's trey, Hawaii did not score for 2 1/2 minutes. Grice broke the spell, sinking the second of two free throws with 12:16 left. The turnovers (11 with 4:55 to play) continued as New Mexico State increased its lead to 25-12 on a fast-break layup by Carla Denning with 7 minutes left in the half. A layup by Grice, Solia's 3-pointer and then two free throws by the senior forward cut the NMSU lead to 25-19 with 4:05 left. The teams traded points the rest of the half, leaving the Aggies with a 30-24 lead. The Aggies scored 12 points off UH turnovers and held the Wahine to a .308 shooting percentage from the field in the half. Hawaii cut the NMSU lead to 32-31 early in the second half. Tanya Smith took a long pass from Saundra Cariaga to score on a layup, Pam Tambini rebounded and scored and then hit a 3-pointer with 17:14 to go. Two field goals by Neal and three jumpers by Jawara countered treys by Cariaga and Taylor to keep the Aggies ahead by five points, 42-37. The Wahine went on a 7-2 run to tie it 44-all on Smith's layup. After a free throw by Jawara, Taylor drove in from the right side for a short jumper to give UH its first lead 46-45. A Smith free throw and two by Grice extended the margin to 49-45 with 6:35 to play. The Aggies, who outscored UH 20-5 off turnovers, controlled the rest of the way. "All the visiting teams won in the WAC tonight," Bolla said. "It's not the end of the world. We need to come back Saturday and get a win and we're right back in it." 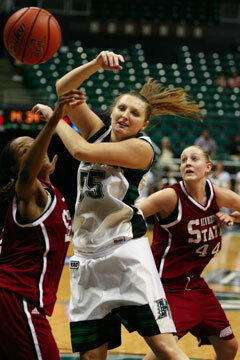 The Wahine host five-time defending WAC champion Louisiana Tech (6-8, 1-0) in a 7 p.m. game tomorrow. 3-point goals -- NMSU 4-14 (Bribiescas 2-2, Russell-Nava 2-8, Neal 0-1, Holt 0-1, Spanich 0-2), Hawaii 5-14 (Solia 2-3, Tambini 1-2, Cariaga 1-4, Taylor 1-5). Personal fouls -- NMSU 15, Hawaii 14. Fouled out -- Smith. Steals -- NMSU 10 (Neal 7, Holt, Foster, Walton), Hawaii 5 (Grice 2, Smth, Taylor, Cariaga). Blocked shots -- NMSU 6 (Neal 2, Holt 2, Spanich 2), Hawaii 2 (Smith, Grice). Turnovers -- NMSU 11 (Jawara 4, Foster 3, Neal 2, Spanich, Denning), Hawaii 19 (Grice 8, Tambini 4, Smith 3, Taylor 2, Kotani, Zagrobelna). Officials -- Penny Davis, Eric Larson, Kyle Bacon. A--1,007.